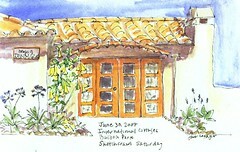 Today we had record attendance for our san diego sketchcrawl--24 people! 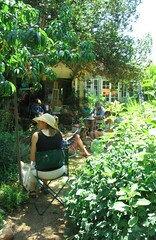 We gathered in Helen's beautiful backyard garden in Vista. Lori took this photo. Very Giverny-like! And the weather was perfect. 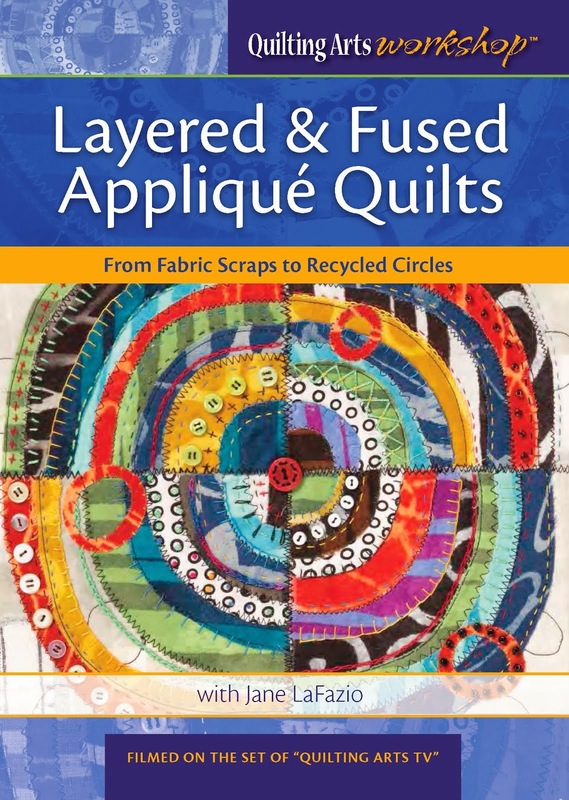 I had the lovely experience of curating an online exhibition at Studio Art Quilts Associates online. Check it out. "We need to create a new national consensus. 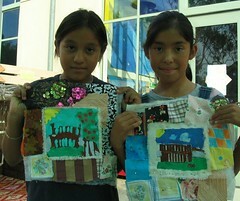 The purpose of arts education is not to produce more artists, though that is a byproduct. The real purpose of arts education is to create complete human beings capable of leading successful and productive lives in a free society. " "Art is an irreplaceable way of understanding and expressing the world—equal to but distinct from scientific and conceptual methods. 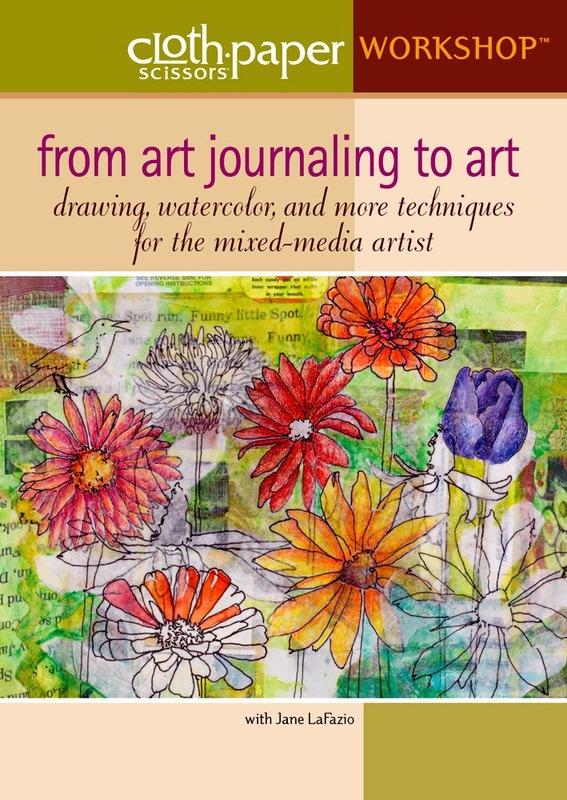 Art addresses us in the fullness of our being—simultaneously speaking to our intellect, emotions, intuition, imagination, memory, and physical senses. There are some truths about life that can be expressed only as stories, or songs, or images. " Makes me feel good about teaching art to kids...and sad that there's not more art instruction in schools. susie's quick sketch of me. 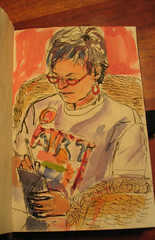 Susan Avery Clark did this watercolor sketch of me when we were in Idyllwild recently. Could BeBop BE any cuter?! It's located in SE San Diego at 45th and Imperial Ave. The painting was a challenge. I painted for 7 hours on Saturday, and luckily the weather was cool and slightly overcast--Thank goodness. The paint is enamel sign paint and mixes well in the can, but it's hard to blend colors on the surface. It drips, when you're not looking and dries quickly. 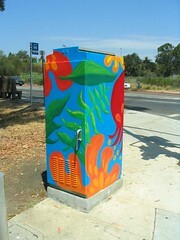 I'm doing two more small utility boxes in August, and I'll be more experienced for those. 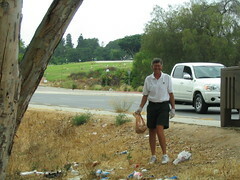 Husb does a very good deed. 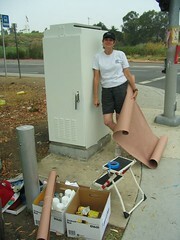 While I was painting the utility box, Husb picked up the trash in the area next to me. It's a major bus stop on Imperial Ave, but has no trash can! He's a good man. Speaking of good deeds, go here and order a 'big fat love' t-shirt or rock. A local guy (Encinitas) started the small company to help pay his medical bills--he has Lou Gerig's Disease. The all-day project begins. Look how fresh I look. That's because it's 8:30am and I've just begun. This is the corner of Imperial Avenue and 45th, in SE San Diego. A youthful advisor stopped by mid-afternoon. I'll post the final photos on Monday, when I go back to finish it. For now, I'll take Advil and rest! I'm pooped! 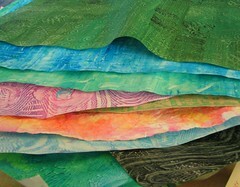 My book in progress at Traci's workshop last weekend. I'll post the finished book soon. 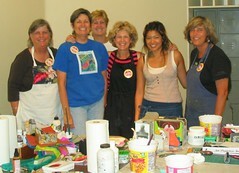 Be sure and check out Traci's blog--she mentions our workshop and there's a pic of me at work, and of my Pom series! 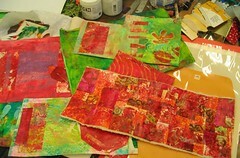 Some of the pomegranate-themed collages I created in Traci Bautista's workshop over the weekend. Red is my favorite color to wear, but I usually don't make art in red---I sure had fun with my Pom series! For those of you readers who live in San Diego, here are two updates. 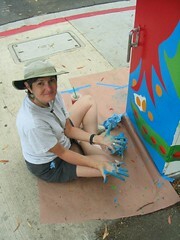 I'll be painting the first utility box this Saturday, July 21, starting about 9am. The location is the corner of 45th street and Imperial Avenue (next to the Jackie Robinson YMCA.) I'll break for lunch at noon and then probably be there till 3 or so. I also plan on painting there on Monday, July 23. Feel free to stop by to say hi, offer me iced tea, cold water sprays and general moral support! And, remember how I raved about Anthology? We went last night to see Kenny Rankin and we reserved a booth on the mezzanine. We shared a bottle of wine, and had dinner. Total cost for the evening $200!!!! Waaaay too expensive for our budget. So, here's my point, if you go (and we will again for Average White Band in November) buy the general admission ticket for the 2nd floor. Eat and drink before you go. Then, order a glass of wine, and maybe dessert while you enjoy the wonderful venue at Anthology. 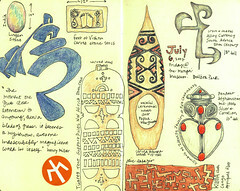 A couple of times a year, I create a journal for a caregiver for SCRC "A Space of Beauty" program. 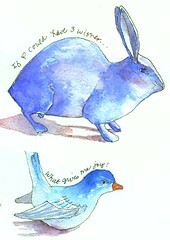 Here are two little paintings, each on a separate page, for the journal. 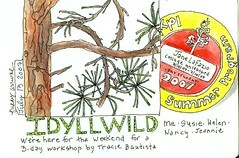 I was so busy in Traci's workshop (9-4 for 3 days) that I didn't get much time to sketch in beautiful Idyllwild. 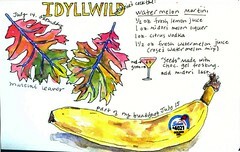 Jeannie made watermelon martinis for us, so my oak leaves are the color of watermelon martinis. 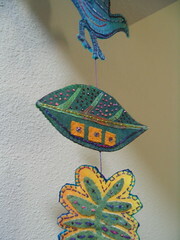 I bought this at the Mingei Museum gift shop, when I was there last week. (Gosh, I love that shop! I've bought tons of stuff from there.) 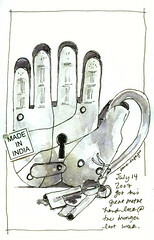 It's large lock, made of metal and (duh) shaped like a hand. I have lots of hand imagery around my house. I know many people must use their mouths, or feet to hold a pen or brush to create art, and I'm very thankful for my strong hands. 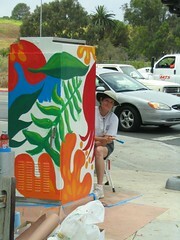 Here are my three designs for the Southeast San Diego utility boxes I'll be painting this month and next. When I'm done painting them, I'll post the photos of the real boxes so we can all compare. Did I mention the largest of the three is 5-1/2 feet tall! Yikes, what have I gotten myself into? 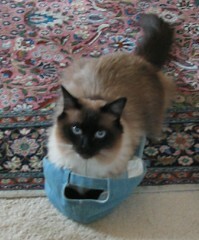 Here's a shot of me in yoga class this morning. I go 2-3 times a week to RB Yoga, and I love it! Just a reminder to check my other blog, where I'm chronicling my year long teaching gig with 4th and 5th grade kids. 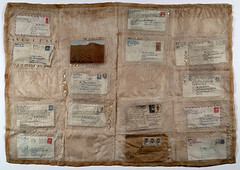 This piece of mine, made from organza and old love letter envelopes, was just accepted into the La Jolla (San Diego) Athenaeum Sixteenth Annual Juried Exhibition. It was selected from 600 entries. The exhibition runs August 4-Sept 1, 2007. Reception is Friday, August 3. Come see it (and me) in person. 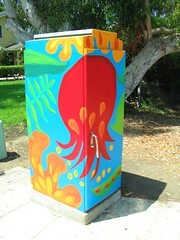 I did get chosen to paint a utility box, and now they want me to design and paint two more! The largest one will be 5-1/2 feet tall and nearly 3 feet wide. The other two are 32 in wide x 38in deep x 44in high. I'll be starting the largest one on July 21, in Southeast San Diego. Please, if you see me, bring me an iced tea and remind me that it's an adventure to paint a large metal box on a busy street corner! I'll definitely post photos. 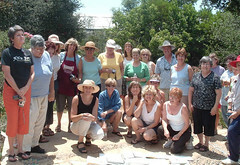 Some friends and I took part in an URN workshop today. 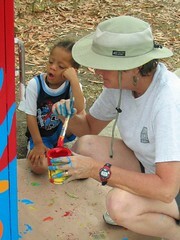 My friend and arts therapist, Kat Kirby, faciliated. 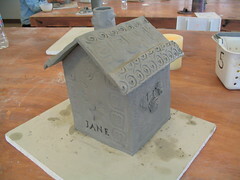 Using clay, we created an urn for our ashes for ourselves, our pets, or purely on a symbolic level. Here's my house. Until needed (which I hope is a VERY long time from now) it will contain my wishes and directives on how I'd like my funeral/cremation to be handled.) This clay sculpture will be fired and then I will paint it with acrylic paints. 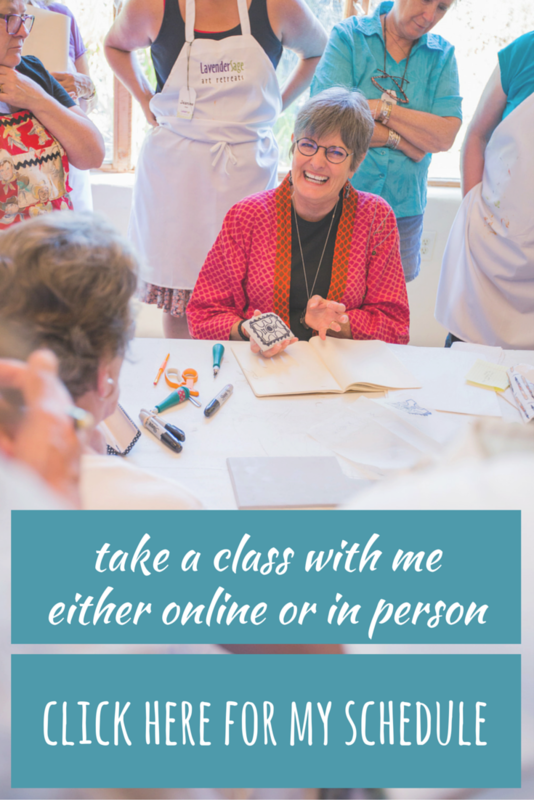 Kat is hosting another workshop on July 22, in Pt. Loma, San Diego. Contact her if you'd like more info. 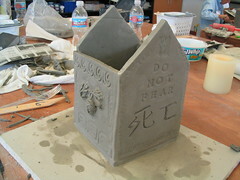 Here's my Urn in progress. One side reads "Do not fear..." and then Chinese symbol for death. Pretty deep stuff for me. Early this year, a number of people in my life died, from young (53) to older (86). It was another reminder of mortality, and how it is sooooooo important, for me, to live my life FULLY. 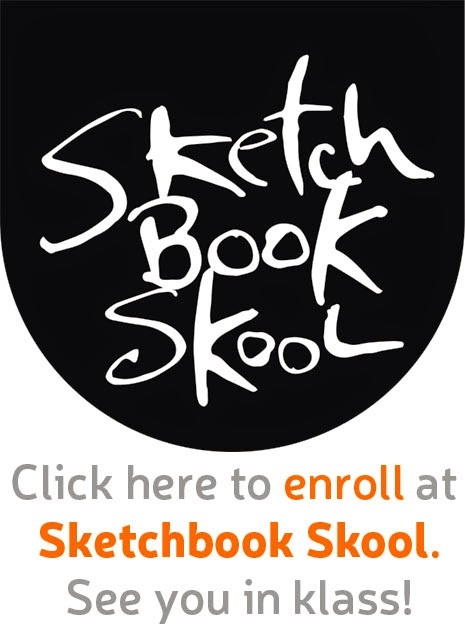 I took an all day workshop with famed book artist Dominic Riley on Saturday. All day long we played with paint and paper! 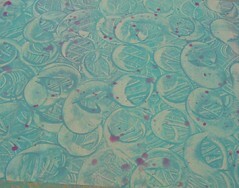 Here's the 13 pieces of paste paper that I made. I'll use them in my artwork. A hour or so at the Mingei Museum. I could have spent a couple of hours more! Such gorgeous items. The broom collection almost brought me to tears--really! Seriously. Here's the finished piece, hanging. It's quite cheery! A close-up. 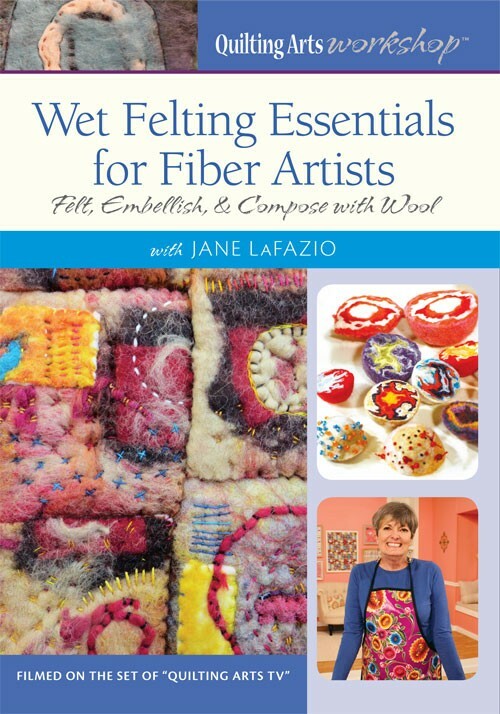 You can see all the french knots and blanket stitch around the edges. This will soon be a mobile. 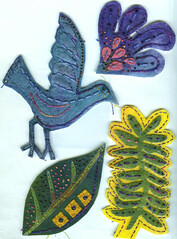 Hand-painted timtex, cut into shapes, stitched and embellished. I'll back it and then string them together. 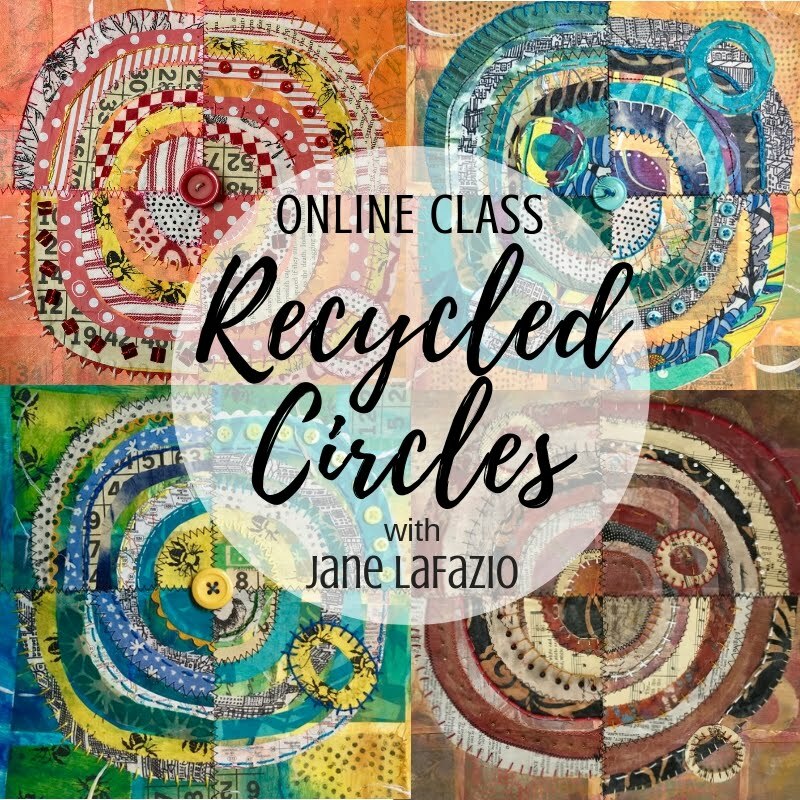 It's already week 6, and the final week of the Personal Symbols online class I've been taking. And you can see I got my money's worth! Thanks to the teacher Susan Sorrell! My friend Ileen and I just cooked up this offering. WE think it sounds waay fun! 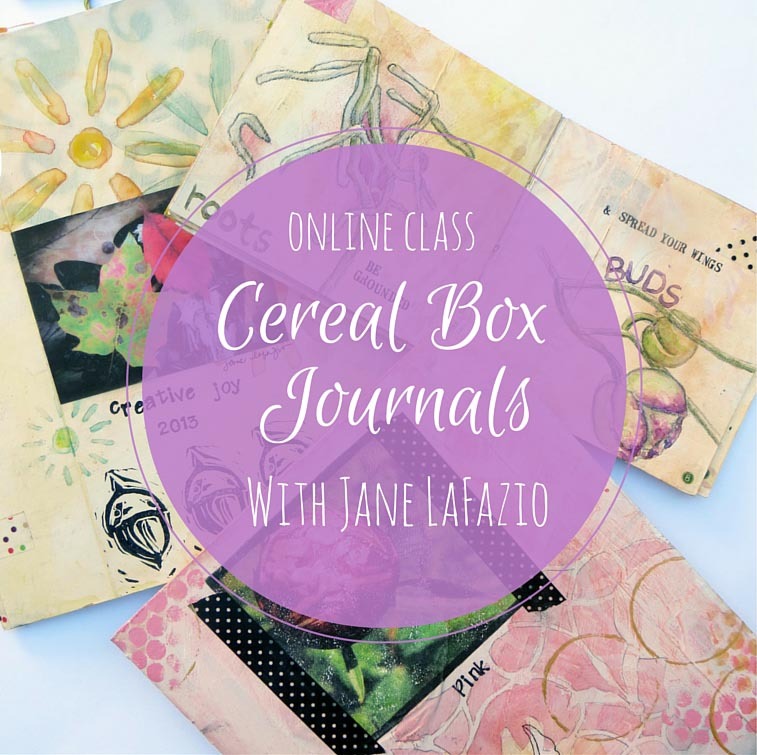 Email me if you'd like to know more, or to register. Ileen will help you enjoy, explore and participate in breath and yoga poses that will activate and stimulate the creative side of the brain, invigorate the mind/body and center your soul. 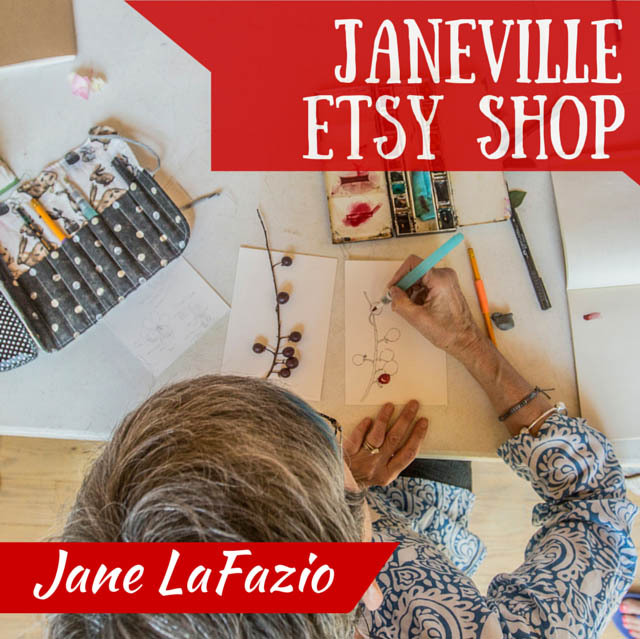 See Jane’s sketches at right here! 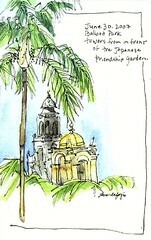 A small group from our San Diego SketchCrawl group gathered Saturday in Balboa Park. It was a gorgeous day. I was in a 'fast and loose' sketching mode, or....I was just visiting more than I was drawing! The Old Cactus Garden in Balboa Park. Rachel told us about it. Now I learn it was created in 1935! 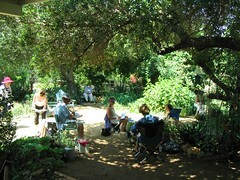 Way cool location, with lots of beautiful plants to sketch and photograph. 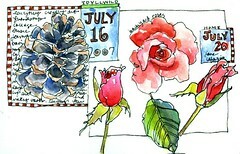 Sketching and talking and watching at least 5 Quinceanera groups arrive in limos for photo opps at the park.